From Flickr user Other Andrew, using the Crabapple Cupcake Bakery recipe. The book, by Jennifer Graham, has been released in Australia and comes out in the U.S. on January 9, 2008. The sweetest little cupcake book around! The once humble cupcake has become an international star - for weddings, parties, anything! And who better to impart her cupcake secrtes than Jennifer Graham, founder of the enormously successful Crabapple Cupcake Bakery. In The Crabapple Bakery Cupcake Cookbook, Jennifer shares with us many of her favourite recipes - including Valentine's Cupcakes, Caramel Lovers' Cupcakes, Church Picnic Carrot Cupcakes and Baby's First Cupcakes. 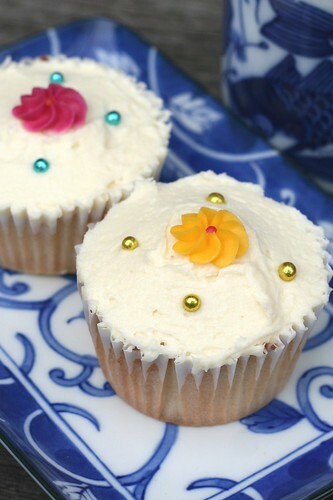 Here's a review of the book at Cakejournal.com, while blogger Cupcaketastic also tested out the vanilla cupcake recipe. Rachel, I feel like such a star all of a sudden! Thanks so much for the shout out and link, I'm glad my humble photo makes a nice addition to your excellent blog! I LOVE this cookbook. I've made these vanilla cupcakes a bunch of times and they are always crowd pleasers. I'm working at trying some of the other recipes over the festive season. Thanks again. Secondly, I just wanted to say that I bought this cookbook and love it! I made the vanilla recipe too and was delighted with how well they turned out. So beautiful and rich! She gives some excellent tips and hints at the beginning of the book, all the recipes are scrumptious and there is a playful bit of humour through her description of each recipe.